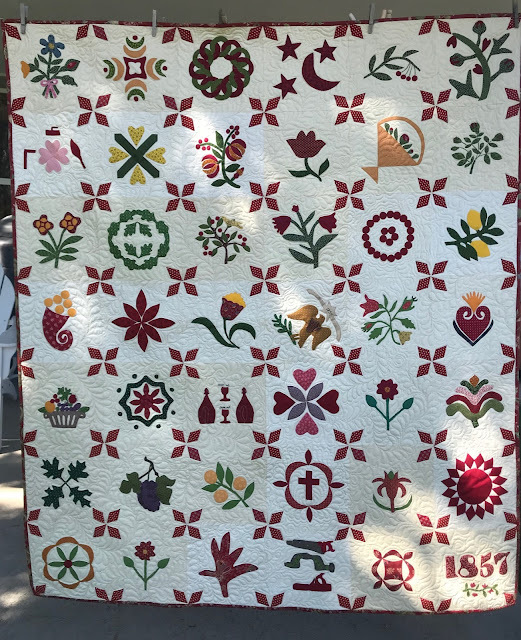 The 1857 Album Quilt patterned by Gay Bomers is complete!! I love the subtle changes of the background muslin I used. I think it instantly ages my reproductions. 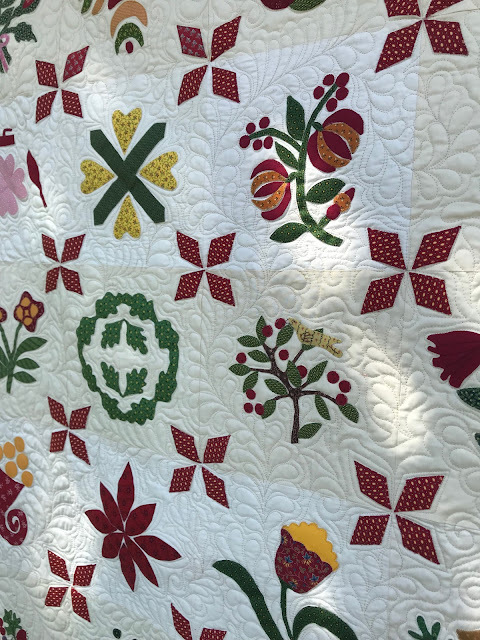 I wanted the quilting to be traditional but free flowing. Sharon Tucker is so good at doing overlays and sending them to me to try and capture what I'm looking for. I love it! Thank you Sharon! 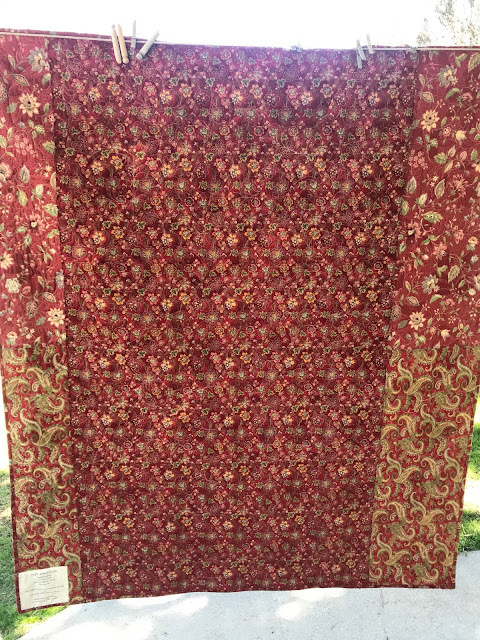 3 reds were used for the backing. Thanks for all your encouragement as I worked on this for many months!! Let's make it a terrific week! If you are near Boise on Thursday I'll be there for a quilt lecture and would love for you to come! 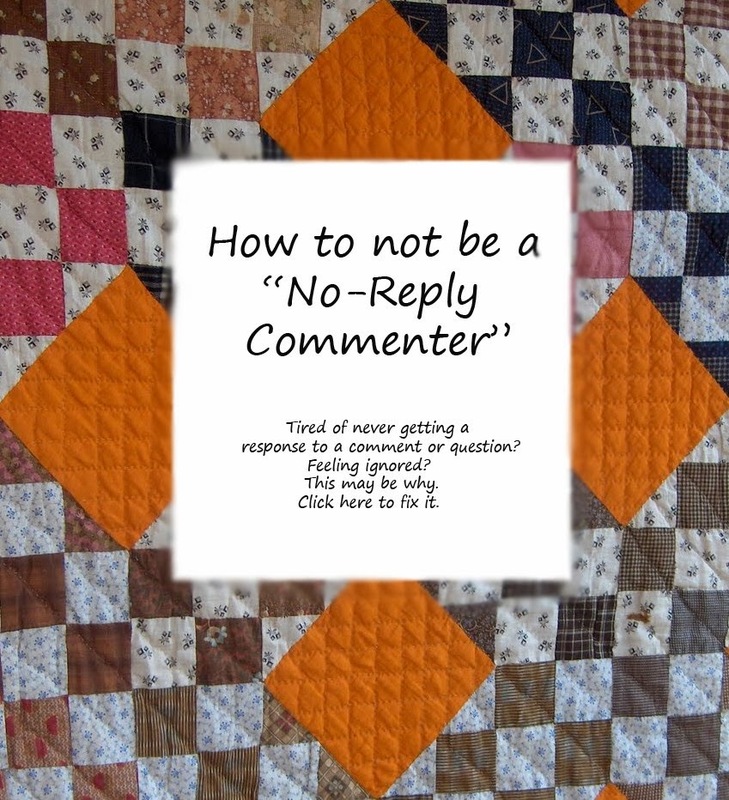 Please introduce yourself as a blog reader!! Here's the link to Boise Basin Quilters. Many have heard the news of the passing of quilt legend (she'd get a kick out of that, wouldn't she??!!) Gwen Marston. 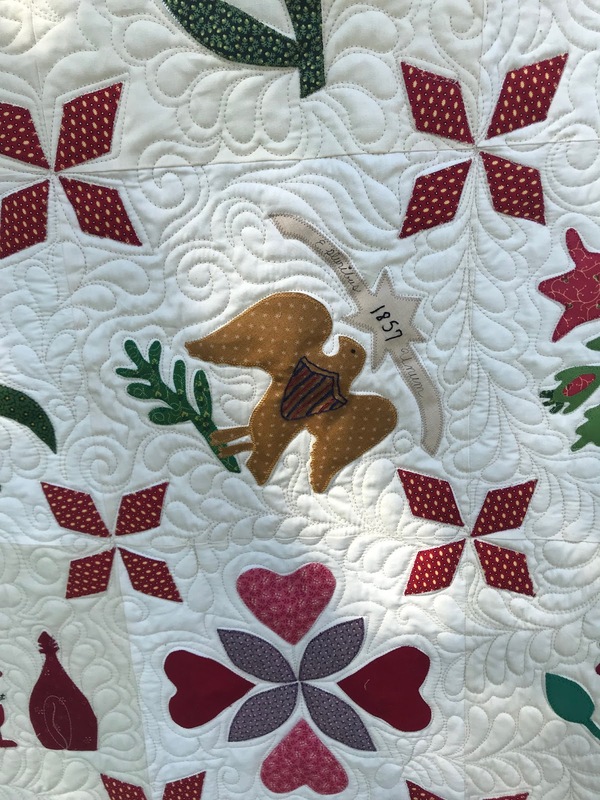 Her influence on the quilt world was huge. She was funny, kind and so expressive. I was honored to have taken several classes and listened to a few of her lectures. This was the last one I attended at The Stitchin' Post in Sisters, Oregon. I can only imagine what she is saying here!! These next few quilts are from a string class I took. The next 2 photos were from the Quilt Museum in LaConner. 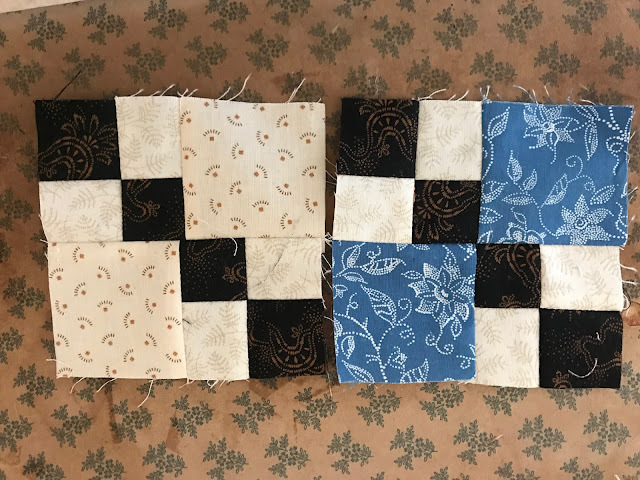 The next few quilts were started in a class with Gwen or inspired by Gwen. 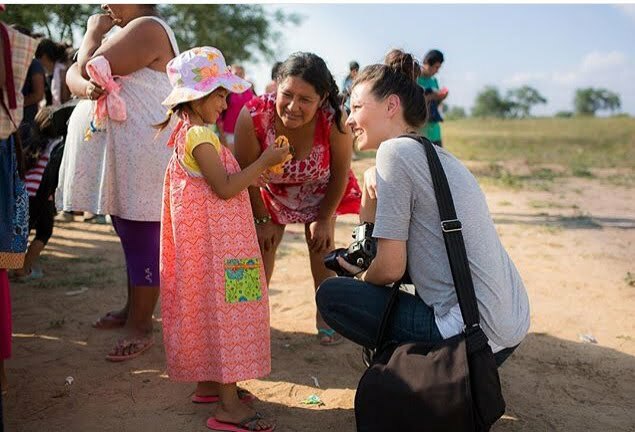 She gave us permission to change up borders! 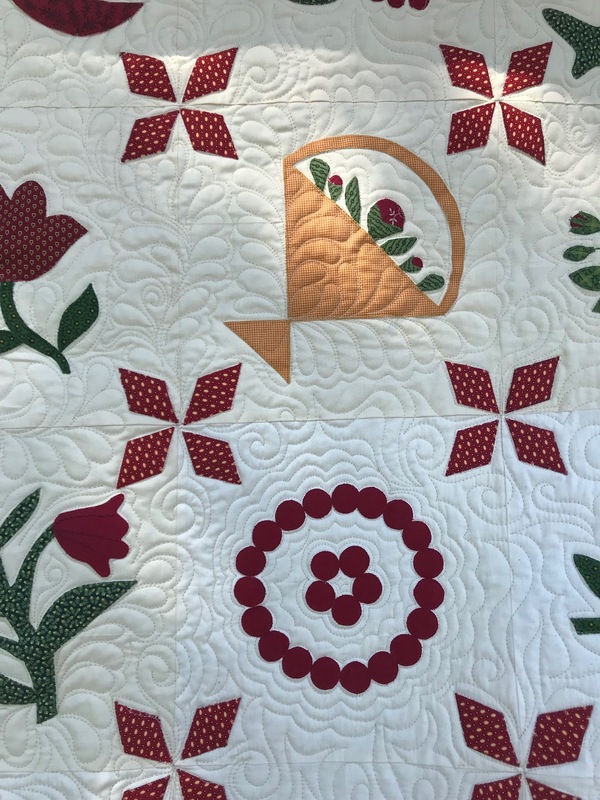 Our fun Gweenie Inspired Round Robin on Humble Quilts! 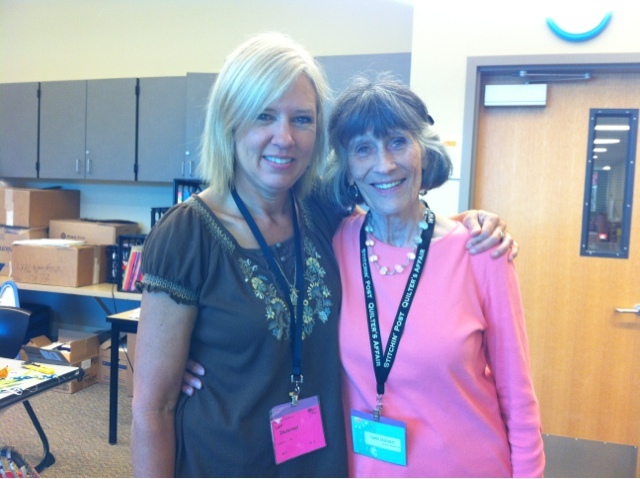 My friend Barb was a friend of Gwen's and influenced her lectures and classes a lot. 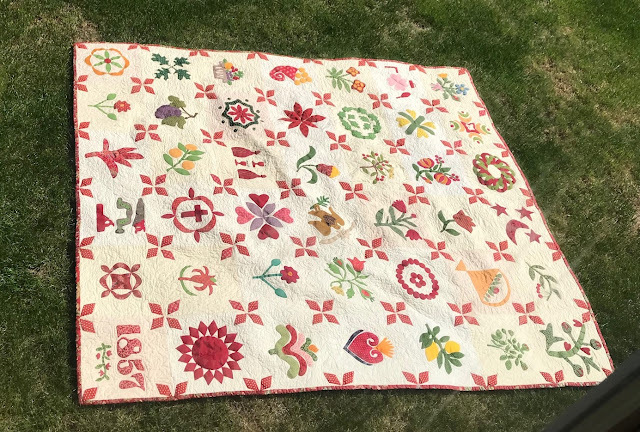 Make a unique quilt and make it your own! I'm making a couple hundred of these 4" double 4 patches. I knew the Go cutter would be a lifesaver for this project. Bonnie mentioned she would show me a fast technique using her Studio cutter. I know Bonnie has all kinds of tricks up her sleeve so I brought a big bag of light and dark strips. And sewed a bunch of them together. Then she proceeded to demonstrate while I took some photos. 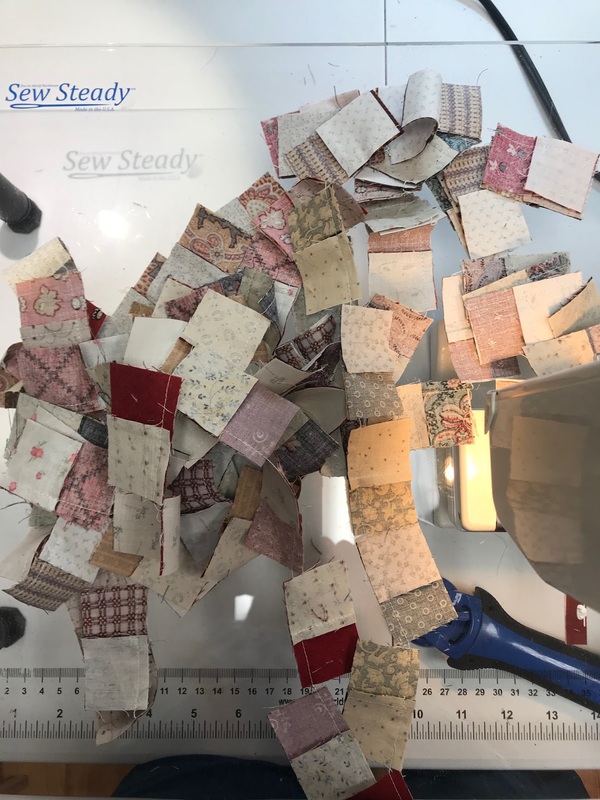 Fold strips in half and cut. Place them opposite colors together nestling the seams. Place your cutting board over the top, roll it through and let the magic begin! 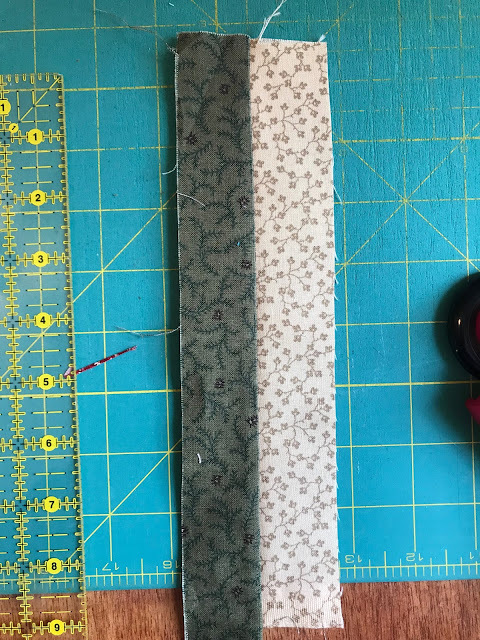 I was having problems with the fabric sticking to the board and she showed me how to slide it off to one side to keep the fabric on the die. She then removed all little pieces, and stacked up the pairs. And in short order I had 100+ 4 patches!! I was so excited! Thanks again Bonnie for the tutorial! I'd love to hear any tips and tricks that you have learned with your cutter. I'm new at it and am still learning. I had a really nice weekend. My friend, Michelle, came on Friday, we attended a women's expo on Saturday, followed by hiking, followed by a local quilt show on Sunday! Here's a few photos from the show, in no particular order. I'm not a fan of most panels, but love this one! My friend Christy, who I retreated with in Sisters this winter, put in 3 of her Bonnie Hunter mystery quilts! I sent photos to Bonnie!! Christy's grandmother made this quilt. I entered a few of my most recent finishes. 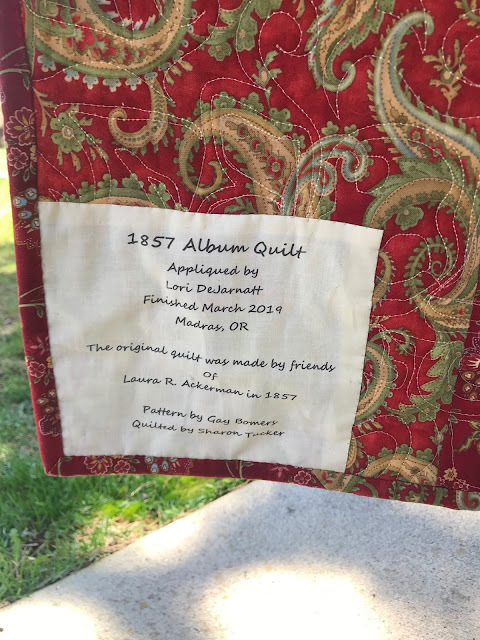 This ins't my style of quilt at all, but the story was super sweet! The tag is below. "Women of courage" That border and blue fabric is so beautiful! 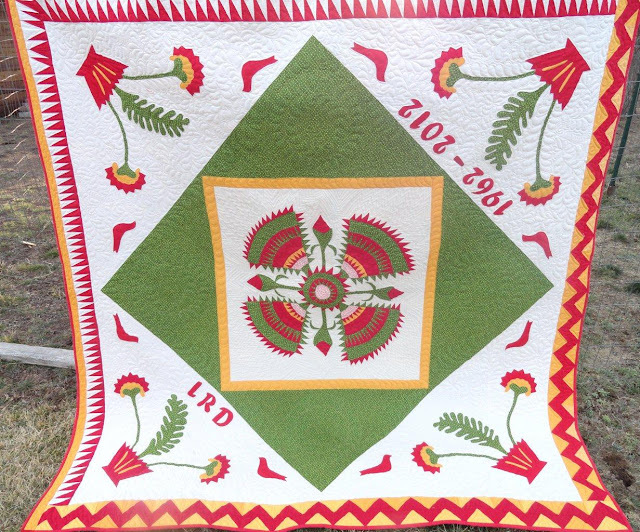 My lovely friend Rachel, entered several quilts, this was one of them. 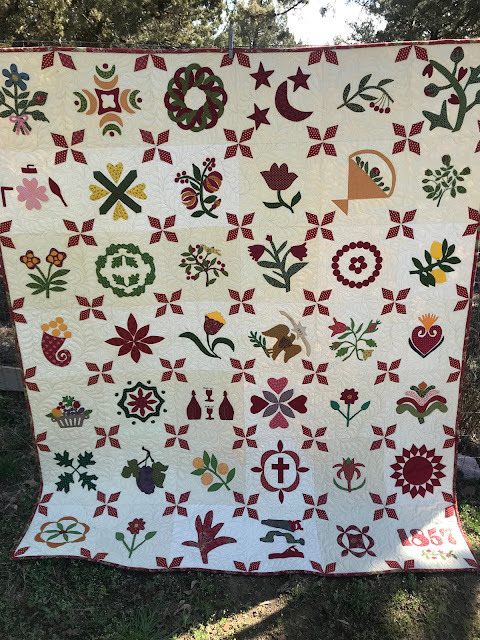 Christy entered this little quilt I made for her.